Welcome to our department for commercial Playground Ships (and other Vehicles!). All of these products are modular in design so the following are examples of what we have done. If you would like a specific configuration to suit your design, please contact us. 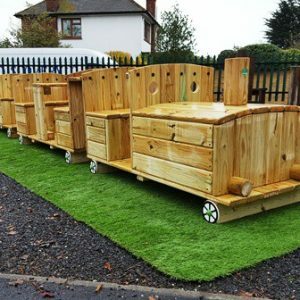 Our delivery charges for the larger Playground Ships depend on location, volume and installation services, so please contact us for a quotation (as a guide £100 - £200 per order). With a low deck height and relatively small footprint, our Pirate Ships are ideal for Toddler Playgrounds. Available with or without a slide and cargo net. A selection of solid planed timber vehicles which are fixed to the ground and can be arranged either on their own, such as the Horse & Cart or Rowing Boat, or one behind the other in sequence to create a longer vehicle such as the Tractor with extra Carriages behind it. These sturdy play vehicles will make a great addition to any playground. A large Ship based play area, with a deck height which is 1.5m (5′) from the ground, this activity centre is ideal for large numbers of children. With a rock wall and cargo net to keep them busy. Playground Ship 2 is a versatile, modular design which allows you to easily customise a play area to suit your particular needs and budgets. This set includes everything listed, please click for more details. A full playground in just 14m x 4m! 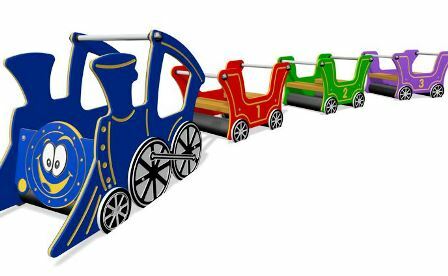 Help develop strength, balance, coordination, and stamina alongside imagination and creative play. This Playground Ship 4 is a full playground and ideal for a large number of younger children. Many accessories are included in this set, please click for more details. Wow, a fully themed Playground Ship with 3 Decks, a Bridge, Rockwall, Cargo Net, Clubhouse…even a Sun Sail! A very large Playground Ship which incorporates two raised decks, climbing net rigging, rock walls, monkey bars, a gangplank and a mast. Playground Ship 7 – stimulating their imagination, providing opportunities for role play, testing their strength and it looks great too! An exciting Fire Engine and a complete Train Set (Engine plus 3 Carriages). Bright colours and very durable HDPE plastic materials. Playground Ship 8 play area, with a deck height which is 1.2m (4′) from the ground, this activity centre is ideal for younger children and a limited space available. A fantastic centre piece for any Nursery or Toddler Group. Made from attractive timber and great for creative play. Playground Ship 10 is a compact play area, suitable when space is limited. Complete with slide, rockwall, wooden roof and mast. Playground Ship 11 is a huge play area with 4 deck areas ranging from 1m to 2.1m high, a rock wall, a cargo net and an enclosed tube slide, great for a large playground. 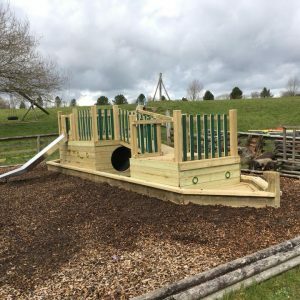 Discovery Play Boat play area, with a deck height of 600mm and 900mm from the ground, this activity centre is ideal for younger children and a limited space available.